With all of the modernizations going on in the home improvement industry, you do not want to be left out. Home building techniques are constantly being updated. If you have galvanized pipe in your home you have probably had some leaks. With that type of pipe, rust is inevitable and homeowners are converting to the much more reliable Pex pipe. 1. PEX piping. You can easily figure out what size you need by measuring the diameter of the pipes you are replacing. There are three colors available: blue (cold water), red (hot water), or white (universal). 2. Plastic sheeting, to protect the areas you are working in. 4. PVC/plastic tubing cutter. You’ll use this to cut your PEX. 8. A saw capable of cutting metal, such as a hacksaw or a reciprocating saw. 9. A few containers to catch any water that may drip from the open pipes. 10. WD40. This is extremely helpful for removing the galvanized pipes. 11. Water meter key. Required to turn off the water at your meter. STEP 1: Turn off ALL water sources to your house. It is advised that you do this at the water main and the water meter. STEP 2: Open all your faucets, inside and outside of the house, and flush your toilets. This is to purge as much water as possible from your water lines. STEP 3: Put down plastic wrap and put containers under the piping areas you are going to cut to catch any water that leaks out. STEP 4: Cut the pipe you are going to replace somewhere in the middle that way you can turn and remove both parts. STEP 5: Spray a generous amount of WD-40 onto the joints your pipe is connected to. If possible, try to get some into the threading itself. Wait about 10 minutes for the WD-40 to do its thing. STEP 6: Remove your old pipes. Using your pipe wrench, unscrew the pipe while gripping the joint you’re removing it from with your other wrench. STEP 7: Wrap your PEX adapter going clockwise with Teflon tape. STEP 8: Screw the PEX adapter into the joint. STEP 9: Cut your PEX tube with your PVC cutter and mark one inch from the end. Make sure the cut is nice and clean. STEP 10: Push the end of your PEX tube into the adapter, all the way to the mark you made. STEP 11: Repeat steps 9 and 10 for the other end, and you are done! Please check out Keemer Plumbing for more great information! Things Homeowners In Houston Texas Should Know! As we have written this article, we wanted to make this applicable for the Houston Texas metro area. However, this is a great guideline for any state in the US. The time to replace your roof is some time when it is over 10 years or older. We would like to educate you with some information that you should be aware of. Those important things we have posted in this article for you below for your viewing on roof replacement cost. What are the signs of needing my roof replaced? 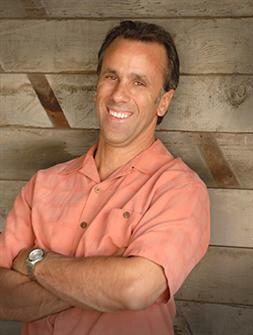 You are noticing a leak or two and want to take care of the problem to prevent extensive water damage. Shingles have blown off of your roof. Another thing you may also be noticing more and more of the old roofing granules are showing up in your driveway. You see this even more after it rains. Or many of the roofing granules are in your gutter. This is a good indication it is time to consider roof replacement. How is the roof replacement cost determined? In most cases, there are four factors that will ultimately determine the total cost involved in a roof replacement. Although there are many roofing companies, here in our Houston Texas metro area. These roofing companies all use the same principles in gathering information on what to charge homeowners for their roof replacement. Considering this information can especially come in handy. You want to be educated as your home is often your biggest asset. You want to make sure that they are using, best roofing practices to ensure for a correctly installed roofing job. 1- The total size of your roofing area. Of course, the larger your home the chances are that the roof area is going to be greater. This is especially true of one story homes and 2 story homes with steep pitched roofs. The more the total size of the roofing area, it is going to cost for the roof replacement. Roofing contractors will use a method called “total squares” of the roof to understand how large your roof is and how much material and labor will be needed for the project. In short, they are taking the total square footage of the roofing surface area. The more the squares of the roof, the greater the roofing project is going to cost. What type of roofing material is currently on your home? Are there wood shingles on the roof now or are they composition (asphalt) shingles? And, how many layers of roofing are in need of removal? The more layers needing to be removed, the more the cost is going to be as this requires more labor and time. Also, the cost to take that removed roof to the landfill is also going to affect the cost. The more layers that have to be removed, the greater the cost. Can you imagine working on a two-story home with a steep roof? Who is going to get up there to make repairs? Certainly not me, you could very well be saying to yourself. A home with a steep roof on a 2nd story home is much more difficult to work on and takes some skill and experience to safely maneuver the body, materials and tools in this situation. Because of this, the roofers install “roof jacks” every few feet, this is to prevent the shingles and the roofers themselves from sliding right off the roof which could be a very dangerous situation. Steepness is one of the reasons the slope of the roof can affect the overall roof replacement cost, in this case would increase the cost as it will take longer and is a much more difficult roof to complete. Generally, the steeper the roof, the more it will cost to replace. Also, on the steeper roofs, you will need to nail the shingles with 6 nails instead of 4. This will stop the shingles from sliding off. Every roofing manufacturer offers different roofing shingles which each come in a variety of styles and warranties. The longer the warranty, the greater the cost of the shingles. “Designer shingles” such as the ultra high definition shingles are more sought after and are more costly to manufacture so the manufactures naturally charge more. This is where you can get as creative with your roof as you want, or not. There are many interesting roofing colors and shingles to choose from. For instance, should you choose a genuine slate roofing shingle product, you will paying 3 – 4 times for your roof as they affect the roofing cost big time! One suggestion that we have if you have is in the south of the U.S.. That is to consider installing an Algae resistant roofing shingle. 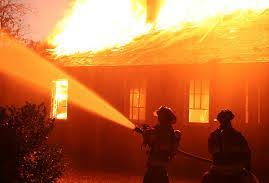 They will cost just a bit more, however you will not have to deal with a roof that gets streaks after a few years. Each of the above factors will have an impact on your total roof replacement cost. Each and every one of them have an effect on the total roof replacement cost. You might want to print out a copy of this to have handy so you can ask questions. Your roofing contractor will instantly know that you have some idea of what you are talking about. We have more information on roof replacement cost on our website. This you should know and educate yourself as you move forward with the decision to replace your roof. That information link will provide you with even more insight and a more educated homeowner about roof replacement cost. Knowing how roofing companies gather a total roof replacement cost, will also arm you with knowledge and knowledge is power when talking with roofing contractors and getting all of your estimates together. This will make sure you do not get taken advantage of. Are you in need of home improvement financing for roofing, siding or new replacement windows? If so we have a solution for you. Our Texas EZ Pay financing comes with a 1% monthly payment @ 4.9% interest. No lien, no closing cost, no prepayment penalties. That is a great deal for Houston Texas area homeowners that want to pay off this note in one to two years. If you want to go longer we have a 1.25% monthly payment @ 7.9%. These are both great financing options! This is what our famed Texas EZ Pay financing is all about! We can get you approved on 60 seconds or less. You just fill out the online form on our sucure website and we will do the rest! Once Approved When Can You Start My Job? When your financing is approved, we will contact you and set a date to get your job started. Usually within one to two weeks. When Will My Payments Start? Not until the job is completely finished and then 30 days after (approx). This gives you plenty of time to get the job completed to your satisfaction. This is a great financing option that gives Houston Texas area homeowners flexibility to get there roofing, siding or windows replaced. Thank you from all of us here at Texas Home Exteriors. Often I receive the question, Greg what is the best siding to use on my Houston Texas home for Energy Efficiency and longevity? With so many choices out on the market these days such as, Vinyl siding, Faux Stone siding, Fiber Cement siding (Hardie Plank) and last but not least, LP SmartSide siding. I will answer this question in one segment at a time. 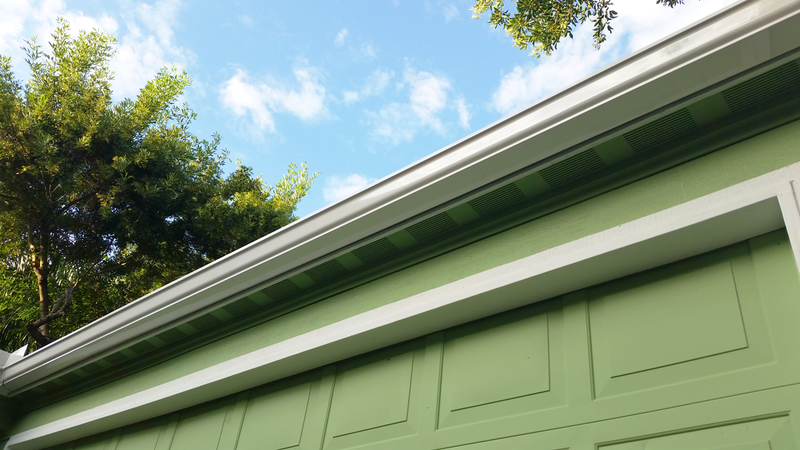 LP SmartSide Siding (Soffit Panels) Boast 10 SQ Inches Per Lineal Foot Of Ventilation. This will allow the home to be cooler by increasing the intake of cooler air into any Texas attac space. As you can see in looking at this Houston home that Texas Home Exteriors installed LP SmartSide Siding on, the lanced soffit panels. 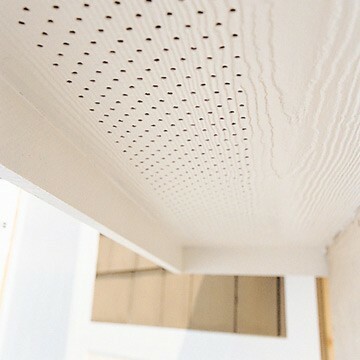 Fiber Cement / Hardie Soffit 5 SQ Inches Per Lineal Foot of Ventilation. This increased fresh air flow will allow any TX home to have an intake of cooler air. This in turn will allow the AC Unit that is often located in our Texas attics to run much more efficiently and use less electricity month after month. As we all know, the less that we use our utilities to cool our Texas homes, the lower our utility bills will be! It is important for your Houston Texas home to have proper attic ventilation to help keep your roof and home cool. Proper ventilation extends the life of your roof and helps to keep the surface of roof cooler in turn reducing utility bills during our long hot southeast Texas summer months! When installed correctly and by using best roofing practices, your GAF roofing shingles will keep the water out of your home, keep your roofing shingles cooler and your home will be cooler and more energy efficient. 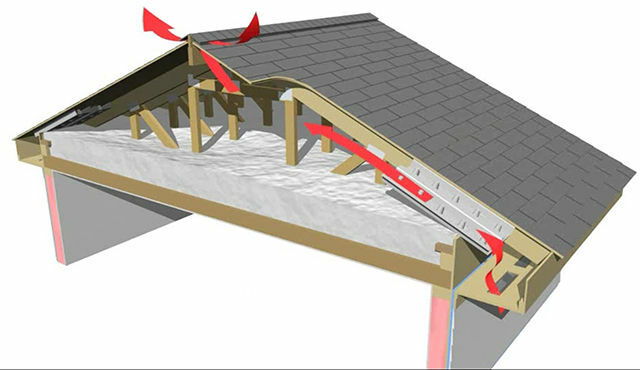 The red arrows in the diagram on the right show how the cooler air is drawn in by the soffit vent and the hot air is pushed out through the Ridge Vent(roof ridge vent) on the ridge / peak of the roof. This type of Texas vented roof system will keep your attic cooler in the hot TX summer months saving you money on your utility bills (AC bills), month after month, year after year for homes in the Houston TX metro area. So here we are again bragging about our workmanship here at Texas Home Exteriors! 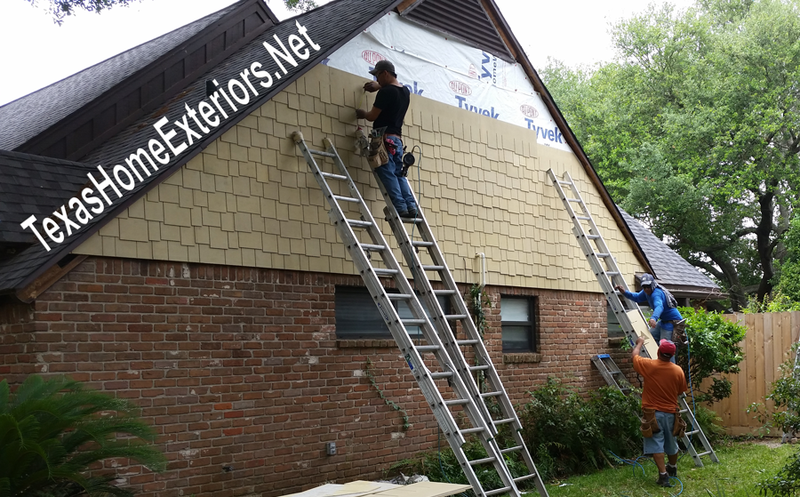 As projects come and go, as you will find, I openly share a variety of siding jobs we complete here in the Houston TX metro area. Some projects photographs are better than others making for excellent before and after photos of the project. This is one of our completed projects of a home located by the Reliant Center which is near downtown Houston TX, a great project for before and after photos. (staggered edge) for accents on selected gables. 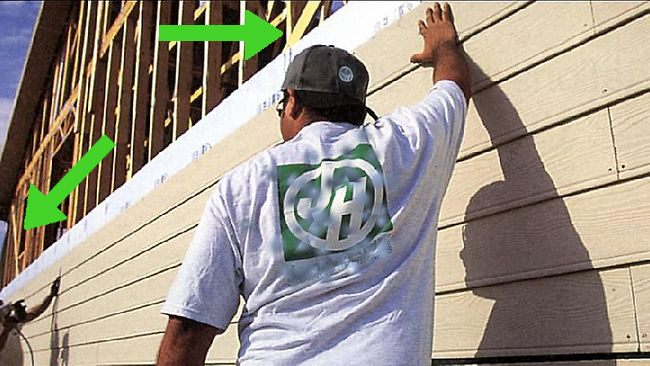 Tyvek HouseWrap was installed under the siding to keep the moisture out of the home and allow the walls to breath. You can see the huge transformation of this home in the before and after photos. 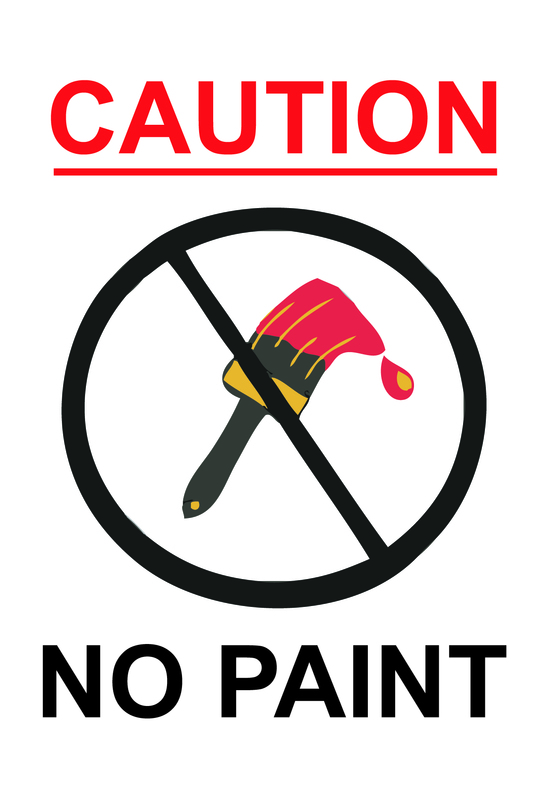 The new paint colors were carefully selected by the Houston TX homeowner. 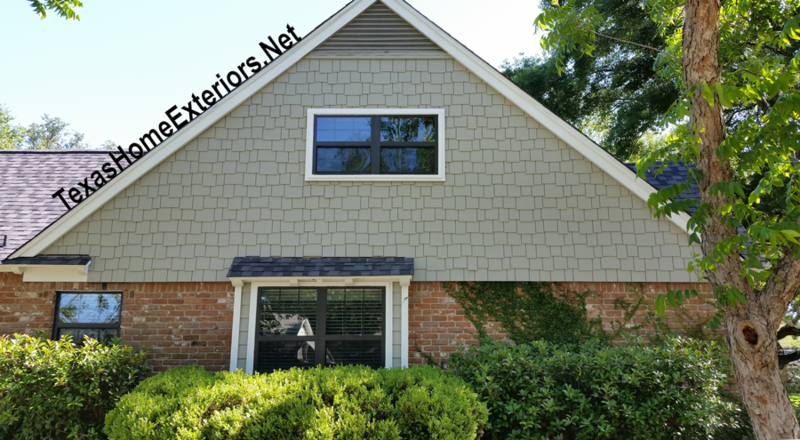 “We hired Texas Home Exteriors to repace the old wood siding on our 50’s house with new HardiPlank and new painted (and in some cases, replaced) trim. They did a phenomenal job and it now feels like we have a brand new home! One the project got started, we met Carlos and his crew, who were all polite and professional. They did minor cleanup at the end of each day and a very throrough cleanup at the end. They worked quickly and the quality is very impressive. It took just over a week to do the entire house: lapboard siding on 4 walls, shingle siding on two large walls and a dormer, painted trim everywhere with lots of replacement (we had a bunch of rotten wood siding and trim), installed new french doors, installed new gutters, painted three doors, and painted the siding itself. Here at Texas Home Exteriors, this type of workmanship can be expected with results your neighbors will be sure to complement you about. For a free estimate, please contact us at 281.919.6999, email info@TexasHomeExteriors.net and visit our website Texas Home Exteriors. 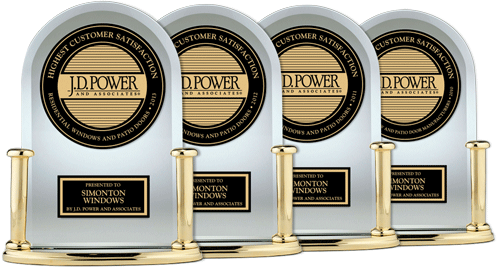 We are happy to assist you and to add you to our list of happy customers! Faux Stacked Stone Siding from Ply Gem installed by Texas Home Exteriors in Houston Texas. So you’re considering new siding for the exterior of your home. Have you considered whether you will be doing a complete siding replacement and/or adding stone accents that will completely update the look of your home? By adding stone accents you can make your home more aesthetically appealing adding great curb appeal, a different look that stands out from the rest. Well, whether you want to increase your home’s value, replace rotted siding or you just looking for fresh look, this post offers some helpful insight about this great exterior product. First off, I find that many folks who decide to replace their siding often duplicate the same or similar pattern currently on their homes. Consider updating the look of your home by changing up the siding pattern by adding accents such as Faux Stacked Stone Siding will adds curb appeal as well as bringing the homes exterior to a more up-to-date look. You will find this will really pay off when it comes time to sell your home not to mention your neighbors and friends will certainly take notice. Ply Gem Mountain Ridge-Faux Stacked Stone-Panels. 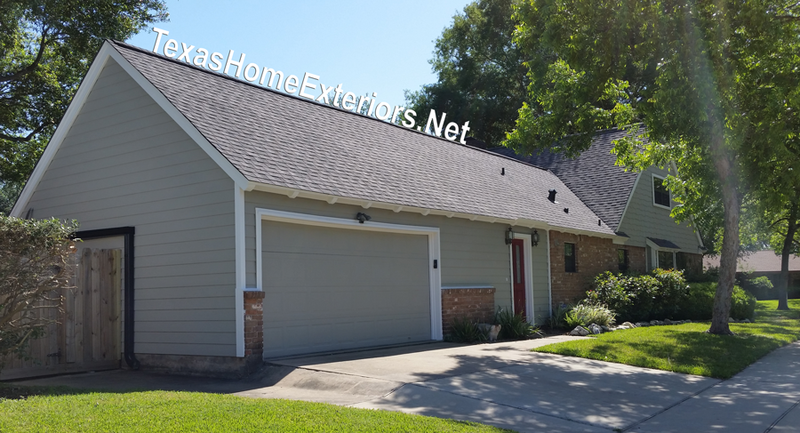 Texas Home Exteriors Houston Texas. 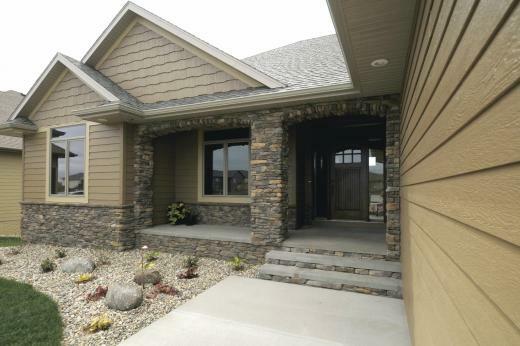 Faux Stacked Stone (natural stone, cultured stone, stone veneer or manufactured stone) also gives any home exterior a warm and earthy feel that says, “welcome home”. 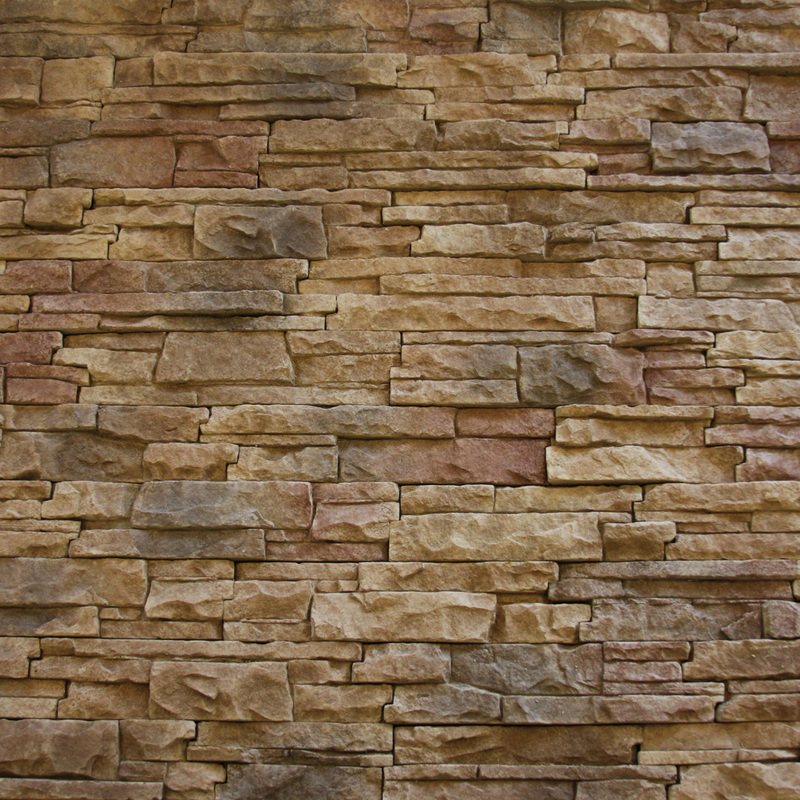 Stone Siding is also the most durable home exterior siding product on the market. Low maintenance! Faux stacked stone does not need painting, will not dent or chip and needs no upkeep at all. To be honest, Faux Stacked Stone Siding will outlast all of us continuing to look good for our children and even our grandchildren. It will surely withstand the test of time for all to appreciate and enjoy. Faux Stacked Stone is a veneer siding product, meaning that it is a layer of exterior product that is installed to finish out an exterior wall and protect the home from exteriors elements such as wind, moisture, rain, ice snow. For instance, here in Houston Texas faux stacked stone keeps the rain and moisture from penetrating into the walls, protecting our homes from the climate conditions of TX. The faux stone installer will measure the linear feet of any corners as well as the square footage of each wall for flat stones. To arrive at the total square footage of flat stones needed, he will subtract the square footage of any openings like windows, as well as the linear footage of the corners. To compensate for normal job site waste, he will order at least 10% more than the final square footage. He will also determine how much premix mortar or mortar and masonry sand are needed for the project. Preparing the walls is key to a quality application, and a weather-resistant barrier is a requirement for both interior and exterior applications. This consists of two layers of either a Weather-Resistive Barrier like Dupont Tyvek HomeWrap or felt (15 lb), metal wire lath and a scratch coat of pre-mix mortar like Quickcrete or type S or N mortar. When these are installed, the scratch coat needs to be left to dry for 24-48 hours. Once the walls are prepared, it’s time to apply the stone. Your installer will lay out stones from multiple boxes to ensure the broadest range of stones for variety and a lower repeat rate unless this has already been organized by the manufacturer. The corner stones are usually applied first, alternating long and short sides. Next, the flat stones are applied on the wall, working them into the corners. Stones are applied by adding mortar to the back and wiggling them onto the dry scratch coat to ensure a seal. To fit stones into the space, your installer will size them as necessary using anything from a wet saw to a chisel or back of a hammer. To finish the look, after the stones are on the wall, your installer will go back around and add a mortar joint grout in between the stones for non-dry stack applications. For a standard joint, as you would see with a fieldstone style, for instance, the installer uses a grout bag to add mortar in the space between stones. When the mortar is thumbprint dry, a pointing tool is used to smooth out the spaces. Drystack applications are designed to show no visible mortar joint between stones. Correct installation will ensure that their will be no problems down the road. 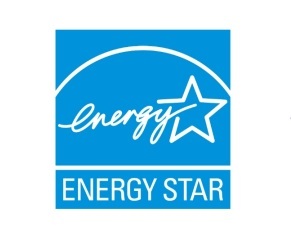 Great companies like us here at Texas Home Exteriors will strictly perform correct practices for installations to meet guidelines set by the manufacturer’s for warranty. With the addition of Faux Stacked Stone Siding you will enjoy the fresh, war look as well as compliments from your friends and certainly be the envy of any neighborhood! Wouldn’t it be great to be the first in your neighborhood to get this great look on your home? 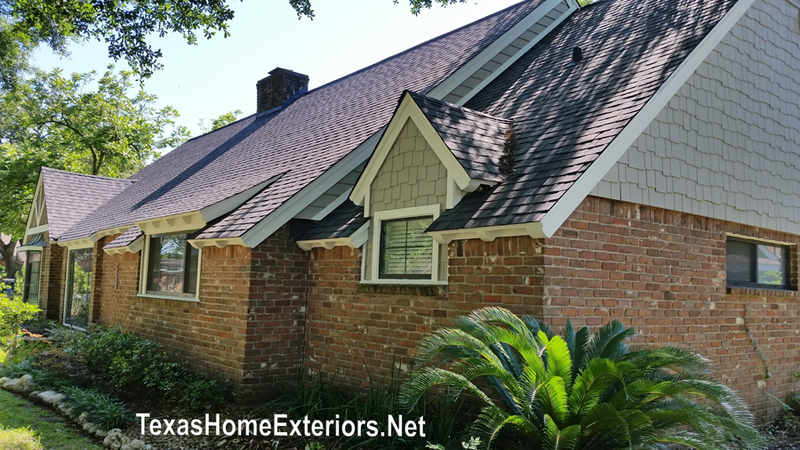 When you call our office at Texas Home Exteriors we will most certainly help you to achieve the look and feel that you desire for the exterior of your southeast Houston Texas home. James Hardie fiber cement Siding is resistant to fires from a side wall entrance perspective. I find myself instantly answering with the same response for some time now, “James Hardie, HardiePlank Siding”. Fiber cement siding, like Hardie, has great resistance to fire due to the cement like properties of the siding products. As many Houstonians know, here it southeast Texas it can get stifling hot in the summer months and can even linger around for what seems like months with no end. We also experience times of drought to the point that our Texas lakes lose all their water due to evaporation, local usage for drinking and irrigation. This presents a problem for many homes close to any wooded area of Texas lakes because they are often built entirely of siding, containing very little brick putting the homes at higher risk of fire damage. The siding on what I call “Texas lake homes” often consist of wood and many of these were built on a budget as second homes away from the city. 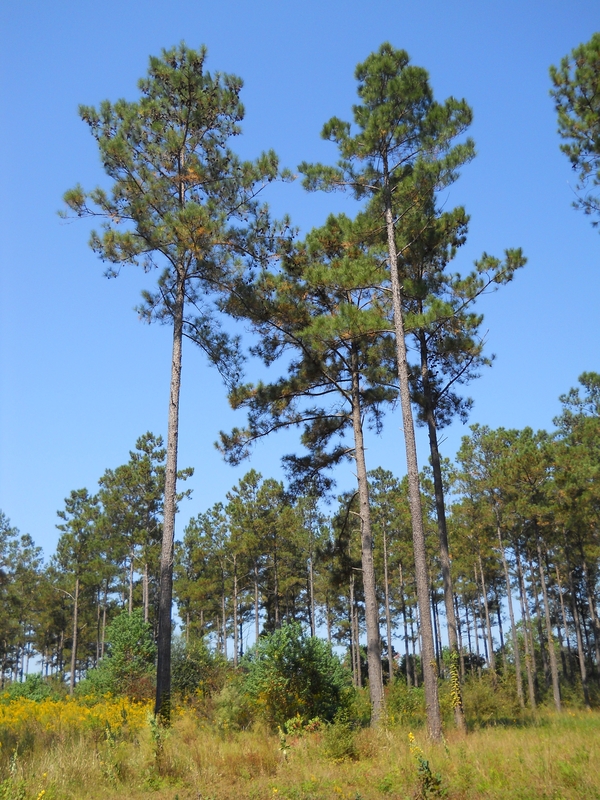 Loblolly Pine Trees are common in East Texas which presents the possibility of rapidly moving fire dangers and the height of these trees make it nearly impossible to extinguish the flames. Here is the Link to review the fire rating of James Hardie wall assemblies. No building material guarantees a fireproof home, but there are some preventative measures Texas homeowners can take to better prepare for the possibility of fires, like installing a non-combustible home exterior siding product like James Hardie Siding (Hardie Plank) that are more resistant to fire. Here in southeast Texas we have the tall and beautiful LobLolly Pine trees that grow up to 93-110 feet or more in height. Fire danger is a great threat to Texas homeowners in our area thus some insurance companies will allow further discounts for homes with fire resistant siding like HardiPlank siding installed in place of existing wood siding. Check with your local Texas insurance company and explain to them that you plan to replace your wood siding and inform them of which Hardie fire resistant siding you intend on installing. I have heard in the past how local TX homeowners have received reductions on their insurance as a direct result of installing fiber cement siding from James Hardie in Houston. 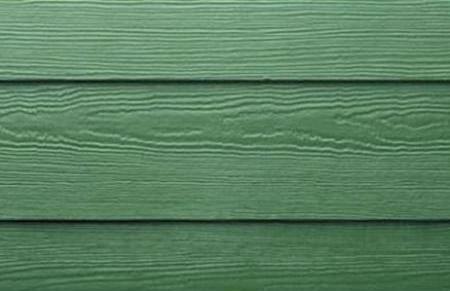 You can clearly see in the image above, the fire resistance of fiber cement siding by James Hardie Siding (HardiePlank, Hardy Board). Hardie Siding provides a resistant barrier on the exterior of your home from a side wall entrance perspective. 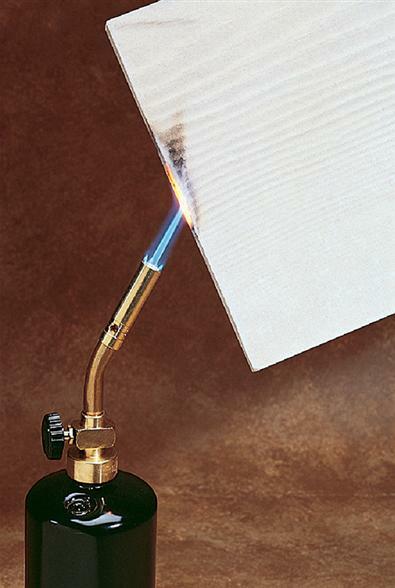 HardiePlank siding does not easily catch fire, as you can be seen in the photo, a lit torch aimed at the fiber cement siding manufactured by James Hardie Products. The Hardie Siding will NOT easily burn and clearly protects the flammable wood studs behind your Houston TX home Hardie Siding. This provides a great peace of mind for any homeowner in the Houston southeast metro area of Texas or anywhere in the country that may be at risk of experiencing a wildfire. James Hardie warranties their siding for a full 30 years. This provides many years of increased fire safety for any homeowner whose home is close to surrounding large trees and would like this extra protection for their home and loved ones. I hope that you have found this post informative and will pass it along or share it with those you believe may benefit from this fire resistant siding information. If you have a home or are building a home and are not considering brick, consider fiber cement fire resistant Hardie Siding and if you are in the Houston metro area, call me personally at Texas Home Exteriors 281-919-6999. Be sure to follow the Kapitan The Siding Man blog to see future posts about home exteriors and more. Fiber Cement or LP SmartSide Siding? An Asset or Liability with Single or Double Wall Construction Houston Texas Department of Insurance “TDI”? With my many years of construction background of building homes, I along with many other home builders and remodelers, know the value of building a strong home. Here in the southeast Houston Texas metro area we have a good amount of wind and with our being so close to the coast, we are also vulnerable to hurricanes. There are two forces a homeowner should be concerned with, or should I say, anyone that lives in wind-prone areas of the USA. One is “uplift force” and the other is “racking force” from shear wind blowing directly at any home or structure. We will be talking about Racking Force in this siding post because it is a concern many homeowners should be aware of. Right around the year 1999 here in Houston Texas many homeowners were being pitched and marketed to move away from vinyl siding and installing, in its place, fiber cement siding. The installation of this product often meant removing the old wood siding, stripping the OSB or plywood sheathing down to the studs and installing the installation of the new fiber cement product. In the photo below, you can clearly see how builders across the country will often build diagonal “let-in” bracing (per the green arrows in the photo) into a home to help combat the racking force caused by shear wind. Single wall construction is when the siding is applied directly to the studs without any sheathing like OSB or plywood first. Single wall construction with fiber cement siding is perfectly fine for non- wind/non-coastal areas of the country as displayed in the photo below. However; for high wind areas, more than diagonal “let-in” bracing is needed as per Texas Department of Insurance TDI Wind department hence, double wall construction with OSB or plywood sheathing is required to be installed before siding for added strength. The best practice of using the diagonal bracing will help stop any home from racking (tilting) when strong winds are blowing. 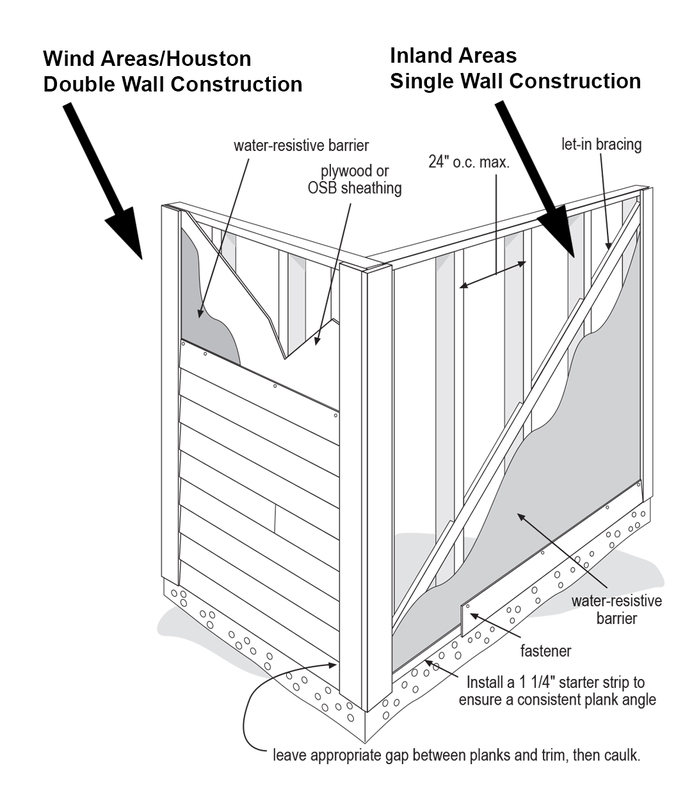 Builders will often install OSB or plywood over these outside walls by nailing them to the exposed studs as can be seen on the left side of the diagram below labeled “Wind Areas/ Houston Double Wall Construction“. Once the OSB or plywood is installed, the builders install siding over that plywood layer. By having this base layer, consisting of some sort of OSB or plywood sheathing attached to the the studs of any outside wall, gives the home increased strength and shear wind resistance to combat racking force. This method is called “double wall construction“. Coming from my many years of experience from using and knowledge of fiber cement, I have found it to have very little structural value and it can break easily. The product offers little structural support (if any) to the outside of a home and can in fact be a liability. Don’t believe me, but try taking a hammer and moderately hitting the Fiber Cement siding, and see for yourself how easily it breaks and crumbles to the ground. I was in shock back in 1999 in Houston Texas as I observed (even participated in) siding contractors removing lap wood siding and T-111 vertical siding ultimately affecting the structural value which had been an asset to the home. This was then replaced with the installation of fiber cement which without installing any OSB or plywood, offered nearly no structural value. 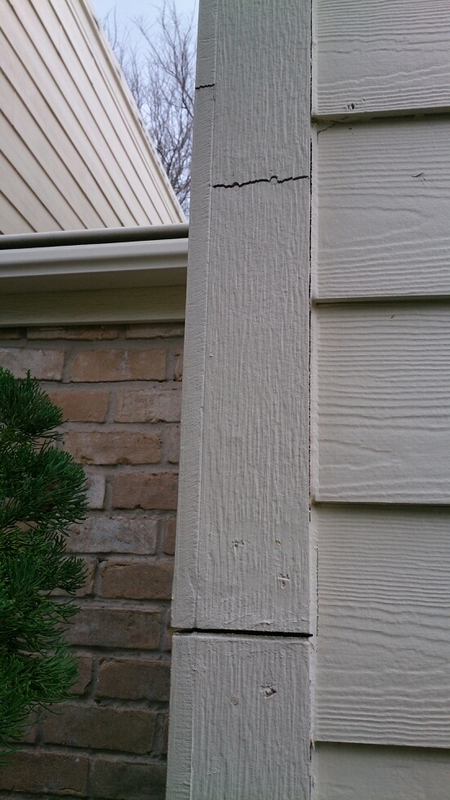 Movement of the home can cause cracking of the fiber cement siding. The image on the right is of a home I received a call on that was a “call back” from an installation by another siding contractor who had removed the old wood siding and did not install any OSB or plywood under the newly installed Fiber Cement. The result was that the home moved causing cracking of the fiber cement allowing water intrusion and causing other problems. This Houston TX homeowner will continue to have movement problems until all of the fiber cement siding is removed and some sort of structural grade of sheathing is installed like OSB or plywood. 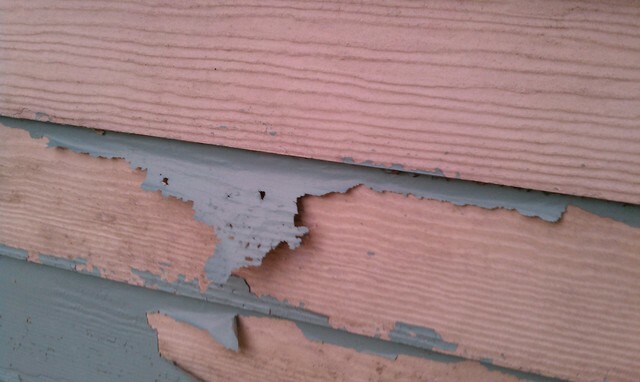 Keep in mind that this homeowner paid over 14k for a siding job that was done incorrectly. In Texas, homeowners often experience movement in their homes, this is yet another reason to install OSB or plywood sheathing before any fiber cement siding is installed, hence, the method of installing double wall construction will add more stability to Houston TX homes. The best way to build strength into the exterior of the walls is with double wall construction. The diagram below shows how to correctly install the layers (sheathing like OSB or plywood – double wall construction) prior to installing the fiber cement siding to help increase any home’s structural value for both shear, racking force wind and any settling movement providing increased strength to the exterior walls of the home. Keep in mind that this is a much better re-siding approach for homeowners when removing old structural grade siding and installing fiber cement siding in its place. This is the best way to build strength into any outside wall for homes in coastal areas that are going to be sided with fiber cement siding. 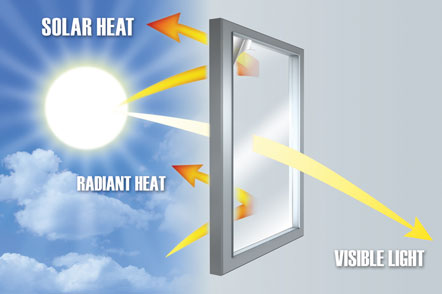 Keep in mind that if you do choose to side your home with single wall construction, a propelled airborne object could quite easily come right through fiber cement siding, the insulation and sheetrock and enter your home! 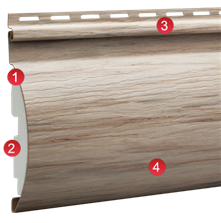 When building or if you are re-siding your home and it has no OSB or plywood under the siding, single wall construction, I recommend using the LP SmartSide Siding due to its proven brute strength. This siding will be an Asset to the integrity of your home’s exterior walls and will help keep those that you love safer inside your home. You do NOT need to install OSB or plywood sheathing before installing the LP SmartSide product and racking force from shear wind becomes much less of an issue due to the increased strength of the exterior walls. 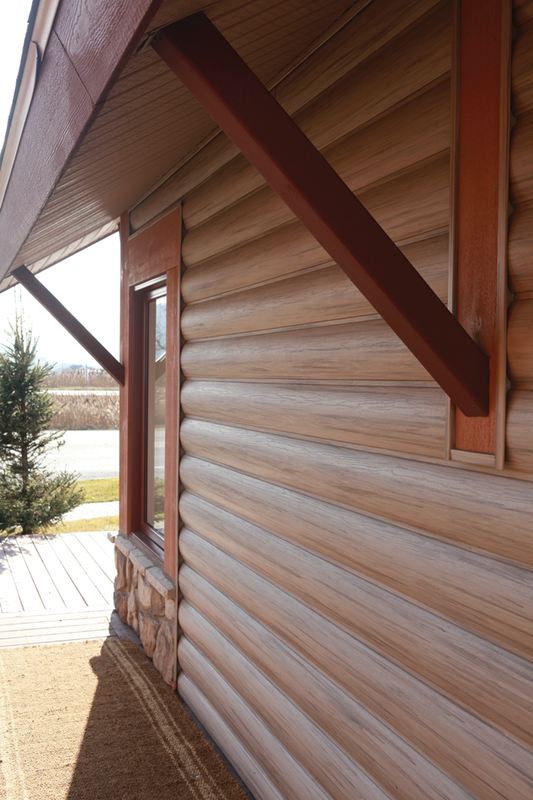 LP SmartSide Siding actually takes the place of OSB or plywood and provides much structural value and looks great too. The must-see video below explains clearly what this means for your home. Fiber cement siding, is a great siding option, however; please insist that your siding contractor install double wall construction with OSB or plywood first for the structural integrity of the building. 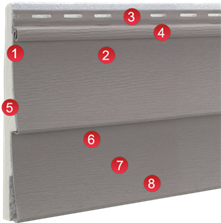 Fiber Cement Siding Installed on Single Wall Construction = a Liability. LP SmartSide Siding Installed on Single Wall Construction = an Asset.